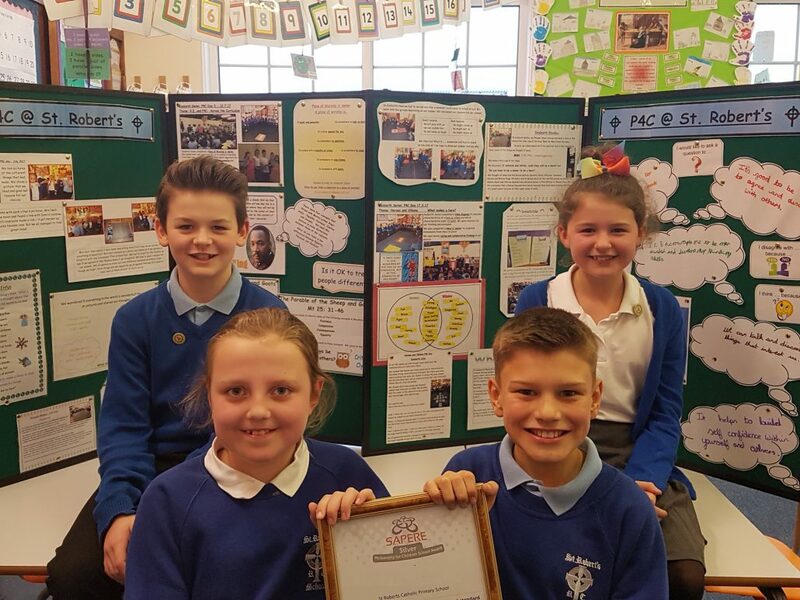 St Robert’s Catholic Primary school, Aberkenfig, are the latest school in the UK and the FIRST in Wales to receive the SAPERE Silver School Award, in recognition of their commitment to the Philosophy for Children (P4C) approach. The P4C approach has a prime place within the ethos and values of the school and is identified within curriculum areas, particularly in English and RE. The school feels that P4C is a powerful approach that boosts children’s reasoning and higher order thinking skills, developing a high level of dialogue with older children using the language of reason e.g. counter-argument, making distinctions, giving examples. Other benefits found by the school are increased self esteem, increased motivation and improvement in pupils’ communication skills. It also provokes from the children more thoughtful and reflective responses to other learning situations and current issues. Junior children using videos and songs as a stimulus to devise their own philosophical questions e.g. can you be friends with everyone? and do you have to be able to speak the same language to be friends with someone? The day ends with classes coming together and sharing what they have discovered and questioned. These days have been shared with advisors and governors, who all comment positively on the use of the approach. Pupils in the school really enjoy P4C sessions. Keira commented ‘it’s great to talk and explore about different concepts such animal rights and punishment’. Alfie added ‘P4C is a way to collaborate and a way to hear other people’s opinions. It helps us to understand that people have a different opinion to us but this is okay!’ Jack and Charlotte like P4C because they can express their ideas to their friends and learn more about their friends’ opinions. Mrs Carmen Beveridge, Headteacher and Mrs Barbara Murphy, Deputy Headteacher and P4C Leader, are both proud of the school’s achievement and that this award has acknowledge the hard work of the staff and pupils in embedding this approach throughout the whole school. P4C is a powerful approach that boosts children’s reasoning, social skills, and overall academic performance. Almost 3,000 teachers a year now are now trained in the P4C pedagogy, reaching around 50,000 new pupils each year. Experience in the UK, backed up by academic research both here and in other countries, has shown that there are numerous benefits from the P4C approach including: increased self-esteem; increased motivation to enquire and learn; substantial gains in oral communication skills, literacy and numeracy; enhanced respect for the views of others and increased confidence in one’s own judgements; and more thoughtful and reflective responses to other learning situations. SAPERE is a registered charity and is responsible for promoting Philosophy for Children within the UK. We provide training and support to schools who introduce Philosophy for Children into their curriculum.